Installing the best double head unit that you can afford is a really great way to upgrade your in-car entertainment. A new double din stereo allows you to add features such as Bluetooth music streaming, Apple CarPlay or Android Auto integration. It can also breathe new life into tired factory speakers or expand your setup with a bass thumping subwoofer. The Sony XAV-AX5000 auto media receiver is a mid-range, satellite-ready head unit. 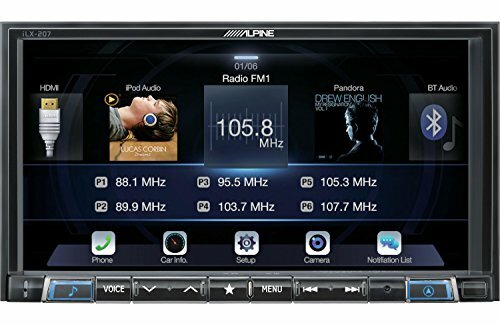 It comes with more functions and features than Bluetooth-only/radio-only models and can usually be found at a lower cost than other models with integrated satellite radio functions. This head unit from Sony features a simple, sleek, bezel-less interface. The resistive touchscreen is large, nearly 7” when measured diagonally. It's worth noting that this screen is resistive and not capacitive, so don't expect it to be as pin sharp as the screen on your smartphone. You also have the option of using physical quick-access buttons along its bottom for changing the volume and skipping tracks. For connecting external devices, you've got 2 USB ports, allowing you to connect two devices at once. So you can charge your phone while you play music from another device. It also has Bluetooth connectivity for voice calls and music streaming. You should be able to connect and stream music from just about any bluetooth enabled device. If you're an Apple music or Spotify subscriber, you can also stream these services from most smartphones. If you listen to satellite radio this unit comes Sirius XM satellite radio ready (although the receiver is sold separately). You can also receive standard AM/FM radio straight out of the box. One other notable feature is the inclusion of a physical remote control. I'm not sure why you would need this, maybe it's to allow backseat passengers to control the unit? Probably the most attractive feature included in this head unit is that it's compatible with both Apple CarPlay and Android Auto. It allows you to access all the wonderful features of these wireless services that you would normally only find in a new vehicle. It's also possible to use existing wired steering wheel controls (although you'll have to buy a separate wiring adapter to make these work). Another cool feature is the camera input port. This allows you to hook up a reversing camera and see what's going on behind you when you are reversing. Not only does this receiver give you more ways to play your tunes, it can also improve the sound coming from your car speakers. The built in amp supports four 55 watt channels with a 4 to 8 Ohm impedance. The amp itself features Sony's Dynamic Reality Amp 2 technology, that they claim will remove distortion and interference from audio. There's also a 10-band equaliser, so you can attune the sound until it's just right. Another useful feature is the Dynamic Stage Organiser that redirects where the sound is coming from by creating a virtual soundstage behind the dash. This isn't necessarily new technology, but can breathe life back into older speakers. Lastly, you can even add an external amplifier and subwoofers to your setup using the 3 pre-outs. The installation process is on par with most other head units, but the main drawback here is the lack of good instructions. The manual includes only around 3 pages on the installation process, with limited walkthroughs and diagrams. If you have never done this sort of thing before, then it may be best to leave it up to the professionals. This Sony unit is great value for money when compared to other similar units. It allows you to connect a range of devices in lots of different ways. If you are coming from an old style cd/radio unit, then it's well worth the upgrade. The only negative you could throw at the Sony head unit is the lack of a higher resolution capacitive screen. It's not a deal breaker, but just not as nice as some of the latest factory fitted units. 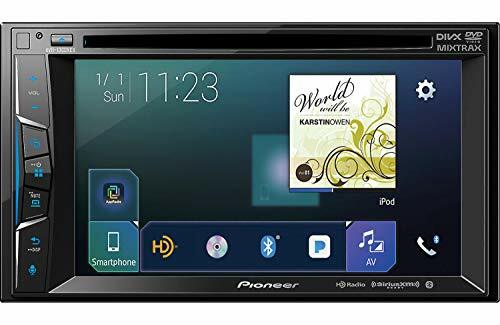 Pioneer is a trusted name in car audio, so it should be no surprise that the audio quality and options on this unit are superb. The AVH-1300NEX is satellite-ready and includes an onboard CD/DVD player, too. Though the touchscreen is a bit smaller than some other units, the integrated physical buttons on the driver’s side are responsive and easy to use. This is a great unit and offers excellent value for money compared to many others on our list. This unit from Pioneer has a 6.2" resistive screen. It might not be high resolution, but it's still very responsive to touch and big enough to display everything clearly. You can play pretty much anything on this unit, even CDs and DVDs. It comes with a standard AM/FM radio and is also Sirius XM ready. As far as connectivity goes, you've got Bluetooth, a USB port and and an additional auxiliary input along with composite and mini-jack outputs. The star feature, and the reason why most people upgrade their head unit, is the inclusion of Apple CarPlay or Android Auto functionality. This unit supports CarPlay but not Android Auto. It does however support any iOS or Android device through it's native interface. So you can stream music or make hands free calls. You can even use some of the apps on your Android phone via the touchscreen, you just don't have the full Android Auto experience. In terms of music and video files, it will pretty much support anything you can throw at it, even FLAC files. The amplifier in this Pioneer unit is fairly standard. It's going to be compatible with most factory speakers, and supports up to four 50 watt speakers (with a 4-8 Ohm impedance. Sound wise, you've got a 13-band graphic equaliser, Auto EQ, time alignment and a high/low pass crossover built in as standard. These help improve the sound coming from standard speakers, and give you lots of scope to personalise your music experience. Unlike many other head units, there are detailed installation instructions provided in a separate installation manual. These include multiple diagrams for each stage of the connection process to external accessories and standard vehicle power connectors. Again, if you are new to this you might be better off leaving it to a pro. This is another excellent double din head unit that offers lots of extra features you're just not going to find on older car stereos. It's a pity it doesn't work with Android Auto as this is going to be a deal breaker for some users. The screen is also a bit on the smaller side and maybe not as high res and impressive as some other screens. One other annoying thing is the location of the USB port, it's on the back. So you'll need to install some sort of extension cable during installation, and then hide it in the glove box or route it down behind the dashboard. To be honest though, if you are coming from an old standard head unit, this one is going to be miles ahead in terms of what it offers. And you've got that Pioneer badge on it too, a sure sign of excellent build quality. This entry level unit from Boss Audio is an excellent starting point if you are coming from an archaic factory fitted unit. 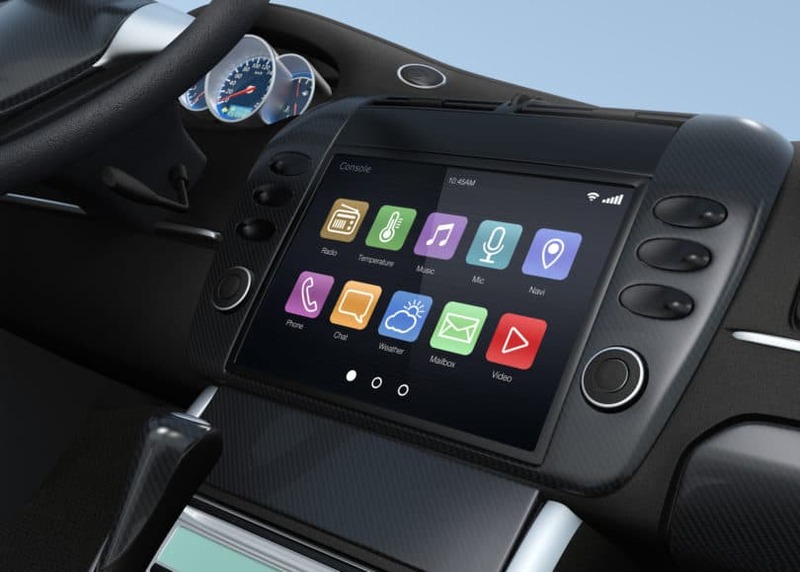 It has a clear, responsive capacitive touchscreen, and offers full compatibility with both major smartphone operating systems, as well as integration with popular features like backup cameras, steering wheel controls, and an auxiliary input port. This is one of the few double din units that offers a capacitive screen. It's bright, responsive and not too small at 6.75". There are also a few physical buttons down the side for things like powering up the unit and volume control. Connectivity is pretty much the same as other comparable units. You've got USB that supports flash drives and playback of a whole host of music and video file types. You've also got Bluetooth for audio streaming and hands free calling. There's also an Aux connector if your device doesn't support Bluetooth. AM/FM radio is also included, but there is no CD/DVD slot, which is disappointing if you still have a big collection of CDs! Smartphone compatibility is the name of the game these days. This double din unit is compatible with both Apple CarPlay and Android Auto, so you're not tied into using one OS. If your car has steering wheel controls you can hook these up to the unit with an extra wiring loom (sold separately). There's also an input for a reversing camera if you have or want to install one. There isn't a dedicated installation manual included in the box so if you have no clue what you are doing then leave it to the pros. If you do want to give it a go, there are a few pages at the back of the user manual that explain the numerous connections and outputs available. Like many other double din units, the USB and Aux inputs are located at the back of this unit so you'll need to route them down through the dashboard during installation. You may also need a wiring adapter to hook up the steering wheel controls. 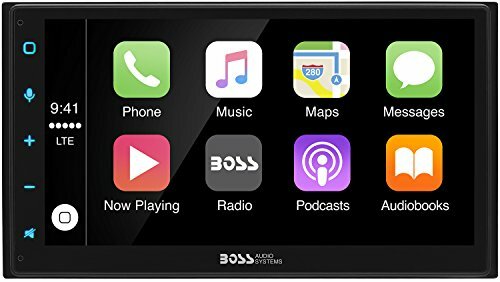 Boss have created a really well built receiver packed full of useful features. It's hard to say anything bad about it. Some people might miss the CD/DVD slot, although I don't personally think that's a deal breaker these days. If you read through the reviews online, you'll see that the boot up time is fairly long (over 10 seconds) and accessing files on a USB drive can be fiddly. Overall though, this is an excellent unit and if your car is 10+ years old, it's going to really improve your in car entertainment options. 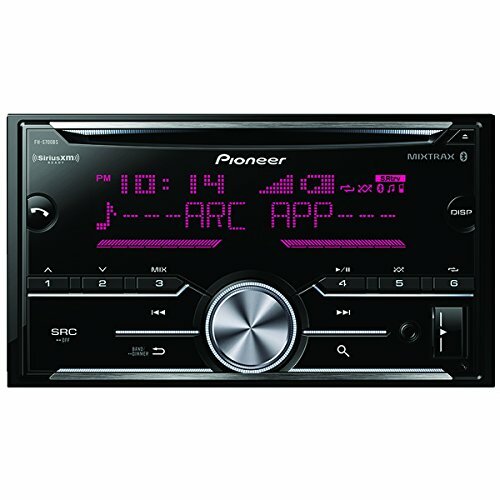 This 'budget' option from Pioneer is perfect for those who just want a quality receiver for CDs, radio, maybe satellite radio, and Bluetooth calls. It doesn’t have many of the features of higher specced units such as advanced smartphone integration or a touchscreen. But for many people it will offer enough features to warrant an upgrade from an old factory unit. Ok, so this particular unit doesn't have a touchscreen and you can't watch videos on it. It's more like a double din version of a standard single din head unit. It features a dual-zone color scheme capable of making over 210,000 different colors. So you can change the background illumination and the text color to suit the interior of you car. The real reason you'll want to upgrade to this unit is to enable music streaming and hands free calling. To support this, it's got Bluetooth built-in as standard and it should be compatible with any bluetooth enabled device. There's also a USB port for streaming from and charging your phone along with an AUX port for older devices. There is no support for Apple CarPlay or Android Auto. You can hook up your smartphone using Bluetooth or the USB port and this will give you limited access to music on your phone. This is supported by the free Pioneer ARC App that makes controlling all of this a little easier. You can also use the Pandora Radio App to stream the service via the head unit. You should have no problem using the S700BS with any factory speakers. It supports a standard setup of four 50 Watt (4-8 Ohm) speakers, along with a further 2 speakers (8 Ohm) and up to a 70 Watt subwoofer. Installation instructions are not the greatest, although this is unsurprising given the budget nature of this unit. There are relatively few hook-ups, however, so it might be doable as a DIY project. Consumers may wish to retain the services of a car stereo installation company if the instructions are insufficient. If you take into account how cheap this unit usually is, then you can't complain at all if there's a feature or two missing! Ok, so it's not going to stand up against a top of the range touchscreen model but the point is, it's not supposed to. This is a basic unit intended for those who want to add basic features like bluetooth streaming and calls to an older car. But by giving access to music on your phone or a USB storage device along with limited smartphone integration. It's going to improve the sound and overall entertainment experience without leaving a hole in your wallet. 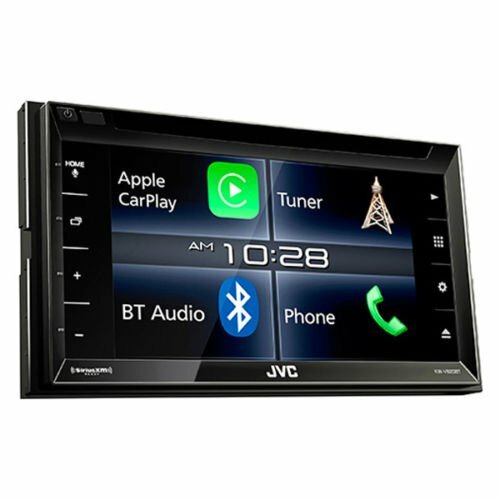 The JVC KW-V820BT is an excellent mid-range receiver with almost all of the features and connectivity you would want in a double DIN head unit. With features such as video input, CD/DVD playback, USB, backup camera support and a wireless remote for backseat passengers; it's well worth considering if you are upgrading your car's entertainment system. 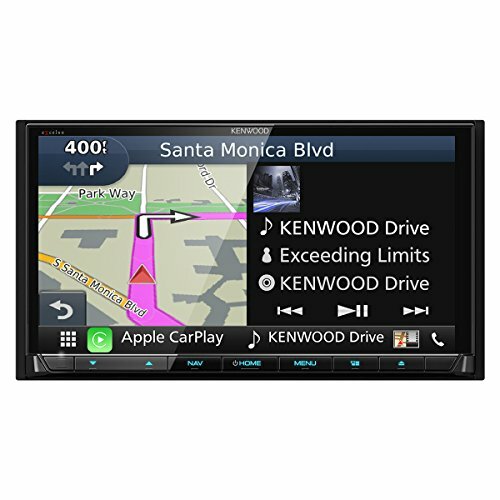 This 2-din head unit from JVC features a 6.8" resistive touchscreen with a customizable user interface. There are also a few permanent touch screen controls along the left hand side of the screen for easy volume and power control. Media playback supports all of the most popular file types including MP3, WMA, WAV, ACC and FLAC. You can also play MPEG1/2, AVI and MKV videos and view JPEG pictures. 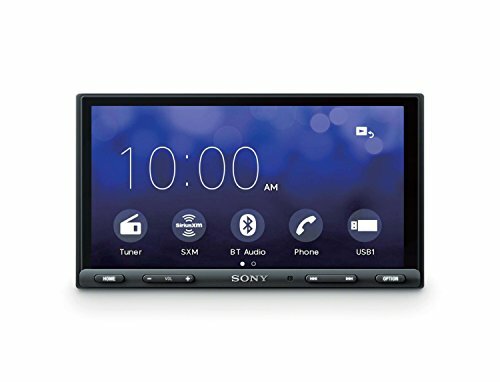 If you are on the lookout for a double din unit with advanced smartphone integration then this may or may not be the one for you. Unlike a lot of other big brand units this one only supports Apple CarPlay, no Android Auto. Bluetooth calls and music streaming work fine with Android devices, but it's not going to do much else beyond that. Comprehensive installation instructions are included in the manual, and are also available for download online. With the right tools and a little bit of experience it won't be too difficult to install. If you are unsure about anything, you should leave it to a pro. This 2-din unit from JVC is well built, attractive and hosts a multitude of features. Unfortunately, it doesn't support Android Auto and this means it's not going to be the right unit for everyone. On the other hand, if you are a die hard Apple fan then most online reviews suggest that it works perfectly with Apple devices through it's CarPlay interface, so it would make a good option for Apple device users. Alpine have been around for years, and are well known among BMW and Audi owners for their excellent quality aftermarket audio components. The iLX-207 is placed at the higher end of the market, and boasts a host of features that make it a great option for Apple and Android users that want to connect their devices to their car audio system. The 7 inch VGA display gives you control of the apps on your device, allowing you to stay safe while driving. The in-built Android Auto and Apple CarPlay provide you with easy access to important functionality via a familiar interface that’s easy to use. It’s simple to handle calls via Bluetooth with voice control. You can also stream music on your device or via apps such as Spotify. The built in amplifier can handle 50W of peak power across its 4 channels, and there is room for expansion via the 6 pre-amp outputs. So if you want to add a subwoofer or two later, you can. Other features include a HDMI input for video and the option to add up to 3 cameras (you’ll need a special adapter that isn’t included). You can also use the screen to use a maps app as a sat nav. And finally there’s the option of adding the iDatalink Maestro module (not included), if you want to retain features that come with your existing factory fitted head unit. This allows you to access such things as climate controls, tire pressure, parking (distance) and temperature sensors. Kenwood is yet another big player when it comes to in car entertainment equipment. They’ve been around for years, going back to the days of the single din tape units of the 80’s. With the Excelon DNX994S they’re definitely moving with the times, and have produced a winner when it comes to a modern wireless in car entertainment system. Everything on the DNX994S can be controlled via the gorgeous 6.95” capacitive display. Using the CarPlay and Android Auto systems, you can control most aspects of your portable device, safely and easily. You can also handle calls and control many apps (such as Spotify) using voice commands. When it comes to navigation, this head unit actually has a built in Garmin system. Many other head units only support the map app on your phone, but this one has a dedicated sat nav included. Because of this, you can avail of split-screen so you can control your music while finding your way around using the map. In terms of audio and video playback, there’s a CD/DVD slot, USB inputs and an SD card slot. It also supports the playback of FLAC and WAV files stored on your device, and you can stream music from most of your favourite music apps. Other features include a 50W peak output 4 channel amplifier, a HD radio tuner, 2 camera inputs, high and low pass audio filters and a 13 band EQ. If you want to retain some existing functionality, you can use it with your existing steering wheel controls and display information about your car by adding some extra modules such as the iDataLink Maestro. Overall this is a great double din stereo upgrade, and with it’s 2 year warranty this has to be a top choice if you are looking to add some extra features to you in car entertainment system. Most aftermarket head units are fairly easy to install with a bit of knowhow, and share a lot of the same features. It's a great way to add smartphone integration or as a way to expand your sound system with an extra subwoofer or amplifier. But before you buy, it's important to make sure it fits your needs and has all of the important features you may need. One of the main reasons that people want to upgrade their stereo system in their car is to give them a way to connect their phone or portable device. The most popular ways this can be achieved is via Bluetooth, USB ports and Aux sockets. Most Bluetooth systems will allow you to stream music and make hands free calls. There are a few different versions of the Bluetooth protocol, the most popular version being v4.0. Some bluetooth systems allow more then one device to connect at a time. This is convenient if you want to take calls on one phone and stream music from another. USB ports will allow you to connect your phone or a storage device and play media from it. Some USB ports will also allow you to charge your device. The charging current won't be as powerful as a dedicated charger (most are limited to 1-2amps) but they will keep your device going while on the move. Keep an eye out for head units that have two USB ports; this will allow you to connect and charge more than one device at a time (handy for vacations or if you've got kids with tablets). The ultimate integration of smartphone and your car is today made possible with the help of Apple CarPlay and Android Auto. These two systems allow you to effectively mirror your phones' functionality on the touchscreen of your stereo head unit. Some of the features include: hands free phone calls, message sending/reading, voice command control, music streaming, navigation control and use of some third party apps. Some head units will support both systems, while others will only support one (often just CarPlay). So make sure you double check compatibility with your phone before you purchase. If you want to expand your sound system by adding extra speakers, a subwoofer or an external amplifier; a great place to start is with the head unit. Most units will allow you to connect 4 to 6 standard speakers. You can also often connect one or more subwoofers too. It's important to check the max RMS output of the head unit to ensure it can handle whatever speakers you intend to connect. You may need to add an external amplifier to allow you to hook up those extra speakers. Aftermarket head units are designed to be used in any car or truck. There are a few things you should keep in mind before you make your final choice. In some cases you are going to need an installation kit with vehicle specific trim to make the head unit fit flush into your dashboard. These are widely available and usually come with all of the screws and clips that you may need. Also, make sure you actually have the space to fit a double din sized head unit. If the slot on the dashboard isn't big enough then you may need to choose a single din unit instead. The other area you may get tuck on is with the wiring. You may need a vehicle specific wiring loom to allow you to hook up the new unit, or make use of existing steering wheel controls. Just like any other accessory that you may buy, you get what you pay for when it comes to head units. The most expensive units will have the most features, and will generally be the most compatible with your portable devices. Premium audio manufacturers spend a lot of money on research so buying the latest most expensive device will mean you are getting the latest features. On the other hand, there are plenty of bargains to be had if you take a good look at the features of some head units. If you plan ahead, installing a new head unit can be fairly straight forward. The best way to be totally prepared is to split up the process into three parts - Removal of the old head unit, installation if the new unit and checking the new installation. This is probably the trickiest part of the process as you can run into trouble removing surrounding dashboard trim and even the head unit itself. Before you start removing anything, check and make sure you have the right tools for the job. Assortment of screwdrivers to remove head unit screws and brackets. You'll need a DIN tool for some head units. These are specially shaped wire tools that are inserted into the sides of the radio to release hidden springs. Pliers and wire cutters. Once you get the radio out of the dashboard you'll need to carefully remove the wiring and aerial connector from the back of the unit. Sometimes these can be stiff, so a pliers or wire cutters (as a last resort) can come in handy. Before you remove the old head unit, it's a good idea to step through the installation process of the new one, to make sure you have everything you need. ​Most car manufacturers use the same 40 pin QuadLock plug to connect the vehicle wiring loom to the back of the head unit. Whilst most manufacturers use the same sized 40 pin plug, some use a different pin configuration for different applications such as Aux Out or CD player. In some cases you can buy an aftermarket connector block to make the new connection plug and play. In other cases you may have to connect wires manually to get the right configuration. Before you start cutting into the wiring, check out the ​wiring configuration for your vehicle and the new unit. If you are installing a different shape or different size head unit, then you are almost definitely going to need some sort of adapter to make it fit properly. These are usually vehicle specific, and most come with all of the screws and brackets needed to finish the job. Your new head unit may come with extra features that involve installing extra cables. 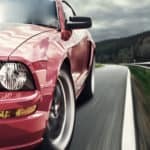 If your vehicle has steering wheel controls, then a wiring loom adapter may be needed to hook up the connectors properly. Most touchscreen head units allow for the installation of a reversing camera. You may want to figure out a route for the cable before you start installation. Sometimes it can be difficult to find a way to get the cable from the trunk area through to the passenger cabin, so it's best to figure this out before you remove the old head unit. It's also worth considering any other auxiliary devices such as USB cables, charging cables and external amplifiers, speakers and subwoofers. Many head units require a permanent live from the fuse board, separate to the existing power cable. This can be tricky to install if you are not familiar with vehicle electrics. Get it wrong and you risk damaging the head unit and constantly draining the car battery. Before you fix the new head unit in place and reinstall the surrounding vehicle trim, it makes sense to check that everything is working as it should. 1. Reconnect the vehicle battery - This will give you power back and allow you to turn on the new head unit. 2.Boot up the head unit - Make sure everything is working as it should, with and without the ignition running. Use your multimeter to check the any auxiliary power supplies with the engine on and off. You'll want to make sure that switched and permanent lives are hooked up properly, and are dead when they are supposed to be. 3.Check any Auxiliary connections - If you have connected up an external amplifier or speakers as part of the installation, double check that they are all working. Also check any connectors that you won't have access to once the head unit is in place. Some head units have USB and CD player plugs that connect into the back of the unit. There you have it; a few tips to help with the installation of your new radio head unit. If you are unsure of anything before you start, it can be well worth getting a ​professional installer to help you out. They are usually reasonably priced and can often get the job done in half the time.